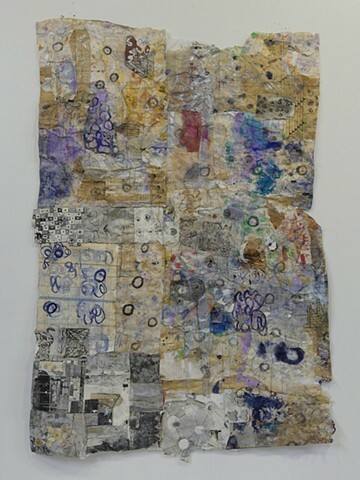 My paper-based collages are dimensional, textured, and use studio detritus combined with recycled photographs,printed matter, painting, and drawings. The process of joining these fragments creates constructed paper collages that access a very personal metaphysical world. I build up delicate surfaces burnishing the surfaces with layers of ink, pencil and rice paper, giving it a rich, tactile, sculptural dimension.I began a series of drawings in 2016 that echo the shapes, colors, textures, empty spaces, linear qualities, and the narratives found in my collages. For me, the visual content in the collages and drawings are related and inform each other.